The only technologies that are realistically available for large scale decarbonisation to 2030 are electrification and biofuels. This concludes Ecofys, nowadays knows as Navigant, in a study for Farm Europe on decarbonization options in the transport sector. Each EU Member State will finalize its Integrated National Climate and Energy Plan (NECP) to 2030 in the coming months, defining its ambitions for renewables in each sector of its economy to meet its obligations to achieve both 32% total renewables by 2030 and up to 40% decarbonisation of the non-ETS sector by 2030. These dual obligations will be challenging and potentially expensive, but they are needed by the EU as a whole to meet its Nationally Determined Contribution under the Paris Agreement. How Member States choose to meet their climate obligations to 2030 will vary, with some options carrying a large potential, but also high risks of failure or simply high costs. Realistic and affordable solutions should form the bulk of each Member State’s policies. The transport sector is the only sector in the EU in which almost no climate progress has been made to date and that also anticipates the highest growth rate in the coming decade. Because of the lack of progress in the transport sector, transport sector emissions that used to account for less than one sixth of total greenhouse gas emissions in the EU are now about to exceed one quarter. Within the transport sector, few scalable options for decarbonisation exist. All options should be encouraged, but the only technologies that are realistically available for large scale decarbonisation to 2030 are electrification and biofuels. The relationship between these technologies is not either/or. Amongst others, IEA and IPCC state that both technologies need rapid expansion to achieve a 1.5-degree pathway. 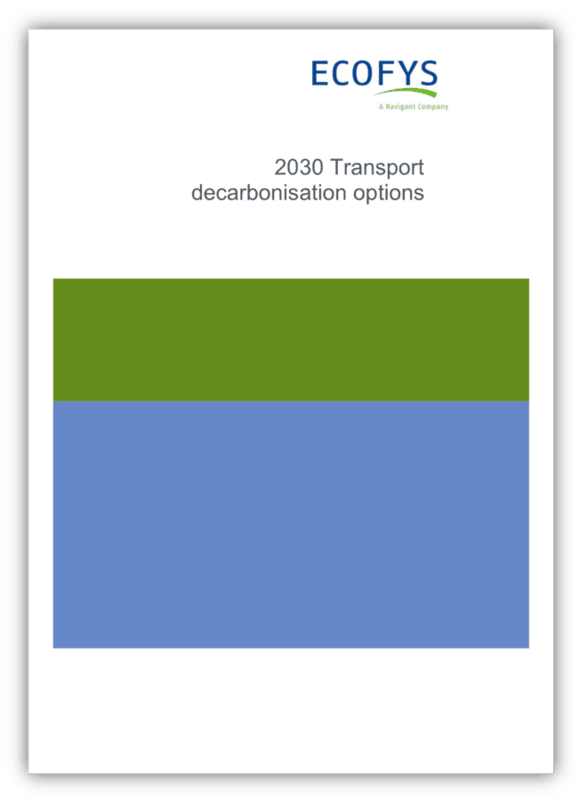 The current study confirms that modest shares of renewable energy in transport will not be sufficient to reduce carbon emissions in the Study Region. Modest means a business-as-usual development in line with the recast of the Renewable Energy Directive (RED II). Even with full compliance with the RED II, we project that transport sector emissions in the Study Region will increase by 38 Mtonne. The absolute consumption of fossil fuels will still increase, and these fossil fuels will have higher carbon intensities than those of today. Instead, far reaching deployment of both electrification and biofuels (far beyond what RED II requires) are needed to achieve significant carbon savings in comparison to today. The structure of RED II disincentivizes Member States who use less than 6% conventional biofuels in 2020, from maximizing the use of conventional biofuels in 2030. Therefore, it makes climate and economic sense for Member States to ensure that they reach at least 6% conventional biofuels use in 2020. Member States that use less than 6% conventional biofuels in 2020 may thus face far higher costs of compliance in 2030 than Member States that attain that threshold. Currently the average carbon abatement cost of electric driving in the Study Region exceeds €700/tonne CO2 equivalent, while the cost of conventional biofuels (inclusive of ILUC) is less than €200/tonne. Using the estimates for commodity prices that have been provided to the Member States for their NECP development, the carbon abatement cost of electric vehicles is expected to fall below €200/tonne by 2030 and the cost of conventional biofuels to around €20/tonne. These carbon abatement cost reductions require not only a continuation of current trends in biofuels, renewable electricity and electric vehicle technology, but also strong and effective governance within the Study Region.